We believe that advanced 21st century literacy is the key to lifelong success. We endeavor to help students read analytically, write effectively, speak confidently, listen actively, and think critically. The development of boys’ critical thinking skills is a priority for our English teachers. Close reading and careful analysis of a variety of literary and media texts empower our students to decode and construct meaning out of the variety of messages they will encounter in their daily lives. 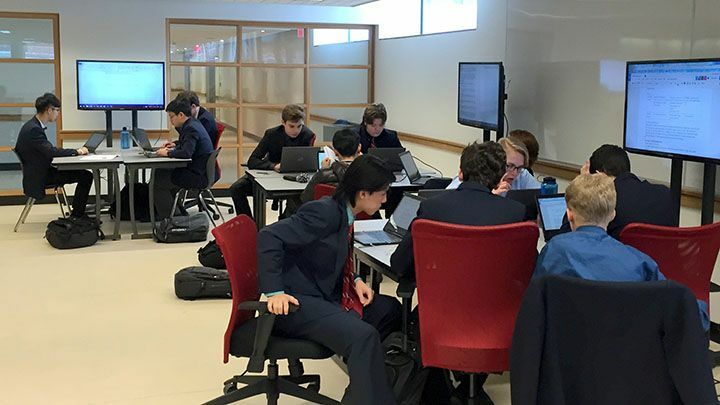 In addition to fostering students’ skill development, we challenge our boys to experience literary and media works of consequence—that’s why we integrate works from the canon of international literature into the curriculum alongside significant contemporary works of fiction, non-fiction, drama, poetry, and media. Our teachers work as a team to select texts that are age and grade appropriate, culturally relevant, and appealing. Creativity is celebrated in the English classroom at St. Andrew’s. Students write short stories, experiment with poetry, or try their hand at script writing, and they are encouraged to share their work with the extended SAC community by publishing their work in the arts & literary magazine or on our web site. We also encourage students to take calculated risks with analytical work and essay writing, knowing that thinking beyond the box and scratching beneath the surface will provide them with the tools to produce more complex and engaging writing for a variety of purposes and audiences. We believe that a process-based approach to writing is more effective than a product-based one. 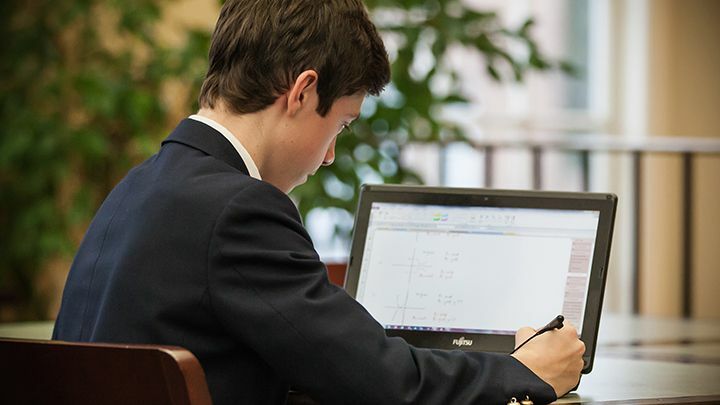 Students are frequently provided with the opportunity to have their work in progress assessed by both their peers and teachers to help with their revision, and our work in the classroom is complemented by the additional support students have available in the Writing Centre. Our students shine on the stage. They regularly practice public speaking and debate. In addition to participating in our own annual public speaking events, our boys compete in local, national, and international competitions and tournaments; they perform in our annual Slam Fest poetry competition, and they produce and perform plays in our Focus Festival of the Arts. The ESL program at St. Andrew’s consists of two courses, ESL 1 and ESL 2, as well as extra help after school hours. All ESL students are required to take the English course for their grade level; in addition, students in grade 9 that the faculty determines need extra ESL support will be enrolled in ESL 1 and those in grade 10 in ESL 2. While in the ESL program, students will be placed in one of the following five levels of study, ranging from beginner (ESLAO) to advanced (ESLEO), and given the tools and encouragement to hone their language skills for success in high school. The units in each course contain a grammar component designed to enable students to work at their own pace to improve their grasp of English, and consist of an online set of lessons and practice materials, in-class lessons using writing and reading resources, and unit tests for all levels. Students will be expected to demonstrate mastery of new concepts on oral and written tests to proceed to the next lesson or unit. For reporting purposes, evaluation will be based on a student’s most recent level of grammar study. In order to graduate from the ESL program, students must complete the ESLEO grammar course. Note: Each course affords students the ability to earn one OSSD credit, but to earn the OSSD and graduate, all students must complete ENG4U (grade 12 English). If further assistance is required, Upper School students may choose to attend ESL Plus or The Writing Center, free support services for individuals or groups. Teachers may also assign individuals to attend either on a temporary or permanent basis. Students desiring tutoring can make appropriate arrangements through the Learning Resource Specialist. This course builds on students' previous education and language knowledge to introduce them to the English language and help them adjust to the diversity in their new environment. Students will use beginning English language skills in listening, speaking, reading, and writing for everyday and essential academic purposes. They will engage in short conversations using basic English language structures and simple sentence patterns; read short adapted texts; and write phrases and short sentences. The course also provides students with the knowledge and skills they need to begin to adapt to their new lives in Canada. This course extends students' listening, speaking, reading, and writing skills in English for everyday and academic purposes. Students will participate in conversations in structured situations on a variety of familiar and new topics; read a variety of texts designed or adapted for English language learners; expand their knowledge of English grammatical structures and sentence patterns; and link English sentences to compose paragraphs. The course also supports students' continuing adaptation to the Ontario school system by expanding their knowledge of diversity in their new province and country. This course further extends students' skills in listening, speaking, reading, and writing in English for a variety of everyday and academic purposes. Students will make short classroom oral presentations; read a variety of adapted and original texts in English; and write using a variety of text forms. As well, students will expand their academic vocabulary and their study skills to facilitate their transition to the mainstream school program. This course also introduces students to the rights and responsibilities inherent in Canadian citizenship, and to a variety of current Canadian issues. Note: This course is designed for students who have completed ESLDO and ESLEO and who are relatively new to the English language. After many years of study in this discipline, students are called upon to display their all-round skills and knowledge of the English language. A major component of this course is the essay: students read, analyse, and respond to many writings in many styles; they write their own pieces, finishing with a major paper researching a Canadian novel. In addition, students will survey the major writers from Chaucer to Eliot; look at contemporary fiction, poetry, and drama; expand their vocabulary by several hundred words; and write a short story. It is a busy, productive, and vital year. In the AP Language and Composition component of the course, students will focus primarily on non-fiction texts and context. Students will think deeply about language as a persuasive tool and about the dynamic relationship between writer, context, audience and argument. Students are required to take the AP Language and Composition exam on the date determined by the College Board. A mock AP exam will count for the course’s final exam and will serve to prepare students for the AP exam held in May. AP work will be assessed on the bases of the College Board’s AP expectations and Ministry work will be evaluated on the bases of Achievement Chart Categories which take into consideration four key areas of academic achievement: Knowledge, Thinking and Inquiry, Communication, and Application. Course work will be worth 70% of the final grade, a summative evaluation will be worth 15%, and the exam will count for 15% of the grade. One of the primary goals of this course is to expose students to a wide range of writing opportunities, and to equip them for situations they will encounter in the years to follow. In addition to technical writing skills and academic writing, there will be many chances for students to explore the world of creative writing. During the year we will experiment by writing short fiction, poetry, drama, journalism, and a variety of different personal essays. This course is both challenging and fun.